It’s that time again. The Week #4 hitting planner: Who Starts and Who Sits. It’s where I examine the upcoming major league baseball schedule and the matchups to help Fantasy owners create their optimal lineup. Last week, I focused significantly on the disparity in games played. This week that same disparity exists and it will have its place in this space, but it is less relevant than it was last week because there are fewer teams with a five-game slate. I sat Xander Bogaerts and Andrew Benintendi because of the schedule last week, but with only three teams scheduled for five games, the “opportunity disparity” won’t have the same impact this one. Unfortunately, I don’t yet have a large sample that I can confidently rely on when I decide who Starts and who Sits. That means this week’s decisions should be based on a more traditional “best player” approach than scheduling. Matchups do matter and I’ll be looking with keen interest at the matchups and the splits, and 2019 performance. But, this week, it’s a consideration rather than a fundamental part of the process. It’s impossible to ignore a two-game disparity when deciding between two comparable players and I won’t be in this space yet again. There are only three teams with five games on their schedules this week, but there are enough teams with seven game schedules to make players with a shortened schedule Sits rather than Starts. The regular season is upon us! Don’t worry, there’s still time to add that “one more league!” You can start a league, 364 days a year on Fantrax.com. The Pittsburgh Pirates, Oakland A’s, and Houston Astros all have five games on the week four schedule. That means it’s an easy place to start when considering who to Start and who to Sit. If your viable alternatives have seven games to do what these players will be forced to do in five, regardless of whether you own a “must-start” player or not, he has to be considered for the bench when deciding who to Start and who to Sit. Marte is a five-tool top 50 player and a must-start player, most weeks. Week #4, not so much. He is one of the toughest potential sits of any “must start” player in week four. 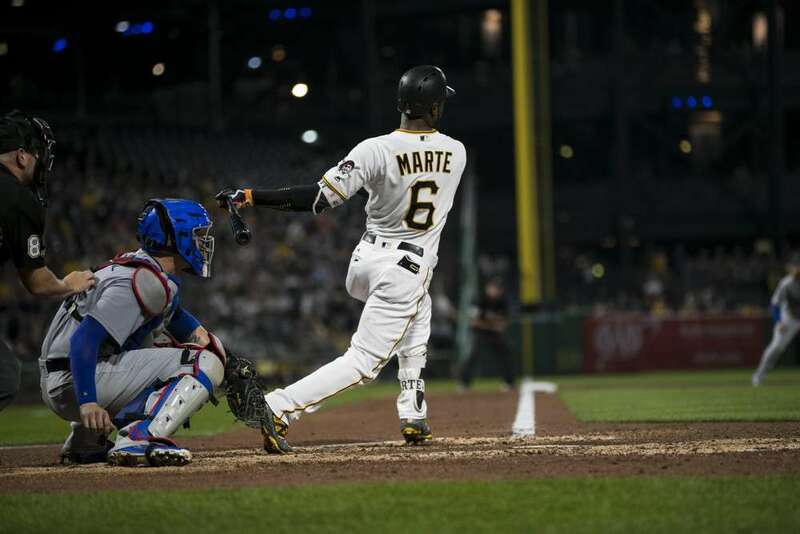 Marte is batting .091 versus left-handed pitchers in 2019, of which he is scheduled to face three this week and he batted .237 with a .725 OPS against that split in 2018. Individually, he has a head-to-head batting average of .200 against Matthew Boyd, .111 vs. Madison Bumgarner, and .167 against Derek Holland, with zero home runs against the group. For the season, he has one home run and three stolen bases with a batting average of .226. Marte’s recent history against left-handers is a rough one. He has struggled early in 2019 and he only has five games to try and buck his trends. When making who to Start and who to Sit, Marte is a tough one, but he is a Sit this week. Bell has been on a bit of a roll recently and in 2019, he has a batting average of .375 in eight at-bats against left-handed pitchers. However, that wasn’t the case in 2018, when he hit only two home runs in 138 at-bats with a batting average of .254 and OPS of .734. He has the skill set to be a starter most weeks and 2019 could be a breakout year for the young power hitter, but with his larger samples against lefties being bad and his week facing three in only five games, when deciding who to Start and who to Sit, Bell is a sit. Chapman isn’t a must-start player, but he is swinging a hot bat and has a friendly group of right-handed opponents on the bump this week. He will face the Astros, but avoid both Justin Verlander and Gerrit Cole. Then, he faces the less-than-dominant Toronto Blue Jays rotation, fronted by Marcus Stroman and followed up by Matt Shoemaker and Aaron Sanchez. The A’s are on fire and Chapman is one of their hottest. He has four home runs, a .302 batting average, and .944 OPS in 2019. In 2018, he had an OPS of .886 with 20 home runs against right-handed pitching, of which he faces four of five this week. Owners deciding who to Start and who to Sit between mediocre or pedestrian alternatives with seven starts, or Chapman and his five, Chapman profiles to be deserving of a rare Start. Decide based on the strength of your alternatives, not the limited number of at-bats he could have this week. Don’t let the shortened schedule be the tiebreaker. He deserves the chance to buck the scheduling disadvantage this week. Laureano wasn’t a top 50 draft pick and while he has had a solid start to 2019, five games, as opposed to seven for your alternative options, is too much to overcome for the potential break out player. I want to recommend Laureano who has batted .298 against right-handed starters in his limited career, but he has only one stolen base and a .258 batting average. The scheduling disadvantage is too much to overcome. The Astros haven’t been the hottest team in baseball and with only five games on the slate, owners need as many trends as possible going their way. I want to start Brantley because he has killed right-handed pitching to the tune of a career .303 batting average and 71 home runs in 956 at-bats and in week four, he faces four of them. But, all of his five games this week are on the road and two are in the hitter-unfriendly Oakland Coliseum. I’m leaning Sit even though my gut wants to say Start. Five games. Just because a player has the optimal amount of games possible in any given week and what is almost an unfair advantage over their alternative peers, that doesn’t mean they are a must-start purely based on the schedule. There are other factors to consider as well. Who do they play, where do they play and how have they been playing. That also might mean, regardless of the number of games, they may deserve the start. Here are a few players owners need to seriously consider starting or sitting and why when deciding who Starts and who Sits. He hit 18 home runs on the road and 17 of his 28 against right-handed pitching in 2018. It just so happens that he faces six right-handed starters, all on the road, and three of them in a bandbox in Philadelphia this week. Conforto is a legitimate starter every week, but with his split, this week he is as close to a must-start as he is going to get. Start him and look close in DFS as well. Cano has a .314 batting average with 228 career home runs against right-handed pitching and this week, all six of his opponents on the bump are of that persuasion. Cano is close to a must-start player at second base anyway, but this week he has a shot to be a star. Look closely at him in DFS as well. Must Start. Pederson hit 24 home runs with a .893 OPS against right-handed pitching in 2018. For his career, he has an OPS of .851 and a wOBA of .363 with 83 home runs in 513 at-bats. It’s a good week to be Pederson and the hot hitting Dodgers because they will face SEVEN right-handed starters this week. In DFS he is a must-look and in weekly lineup leagues, he deserves a start over all but the best of the Fantasy best. The splits are too strong in his favor this week. The at-bats and the home runs should be there in bunches. Must Start. It’s a tiny sample size, 27 at-bats, but Barnes has an OPS of 1.130 against righties this season. Just something to consider when a player who plays a position as punchless as catcher who has a scheduling disparity of seven games, all against right-handed pitching. The sample is too small and his 2018 season was very different, but it’s a 2019 noteworthy snapshot to consider this week. Serious start consideration. They aren’t a loaded offense on their best days, but this week, they may have some of their worst. They face five right-handed starters out of six games and on the bump will be Max Scherzer, Patrick Corbin, Stephen Strasburg, Chris Archer, and Jameson Taillon. Even the bad or struggling pitchers they face have the “stuff” to shut them out and it doesn’t take a lot of firepower on the bump to bust their bats and blow them down like a twig in a tornado. Bench your Giants across the board and that includes the freezing cold, .227 and zero home run hitting Buster Posey. The Mets and Twins will face six, and the Dodgers seven, right-handers this week. The Giants face Patrick Corbin, Max Scherzer, Stephen Strasburg, Jameson Taillon, and Chris Archer this week. The Miami Marlins face Corbin and Strasburg. Tampa Bay is the hottest pitching staff in baseball, with a league-leading 2.33 ERA. They get Baltimore and Boston at home this week. The hot-hitting Seattle Mariners face the fireballing Trevor Bauer and Carlos Carrasco and seven right-handers in all this week. Carrasco stunk last time out so keep an eye on him this week. The St. Louis Cardinals get Jacob deGrom after a rare dud last time and Noah Syndergaard, and five of six righties this week. The Cubs and Tigers also face five of six righties while the Angels, Reds, and Indians are the rare teams that have a bunch of lefties in their crosshairs, four in their six. Good luck Mike Trout and Albert Pujols. Maybe the mighty Albert can rekindle Fantasy owners offensive love this week. The battered and bruised Yankees play ALL of their games at home this week home vs. the Royals and Rival Red Sox. You can follow me on Twitter @CJMitch73 or on Facebook in the Fantasy Sports group “A Podcast To Be Named Later” and we will have a Podcast coming in the not-too-distant future, so keep an eye-out. Fantrax was one of the fastest growing fantasy sites of 2018 and things are only getting better in 2019! With multi-team trades, designated commissioner/league managers, and drag/drop easy click methods, Fantrax is sure to excite the serious fantasy sports fan – sign up now for a free year at Fantrax.com.